Rather than close the doors on five long careers playing electric blues, the members of the Golden State-Lone Star Blues Revue sought to kick up a notch. 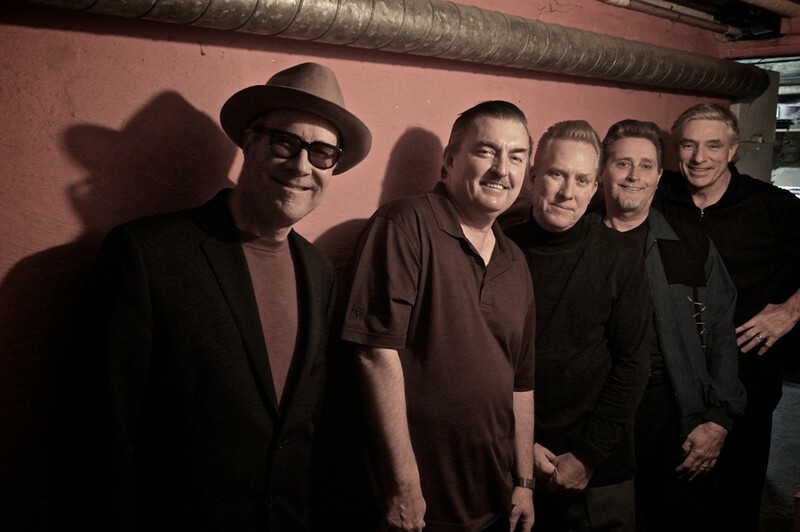 True to its name, the new supergroup draws members from California and Texas, with bandleader, vocalist and harmonica player Mark Hummel joined by guitarists Anson Funderburgh and Little Charlie Baty, drummer Wes Starr and bassist R.W. Grigsby. "We don't feel as beat up as we look," Hummel jokes. "It's a trip going out there when you're in your 60s. Everyone in this band has years and years of gigs and recordings and it's second nature to go out there and play." The group formed a bit at a time, with Grigsby joining Hummel's band and then bringing in his old friend Starr to play drums. Those three began working together about 2010, gigging with some different guitar players before Hummel talked a couple legendary guitar slingers out of semi-retirement. Funderburgh had formed Anson & The Rockets in 1978, while Baty led Little Charlie & The Nightcats for 32 years. "All five of us have known each other for many, many years, but we hadn't worked together as a unit before," Hummel says. All-star lineup in place, the Golden State-Lone Star Blues Revue hit the road for about a year and a half before they began making plans for a studio record. "You want something that's fairly gelled when you go into the studio," Hummel says. "It's one thing to record, it's a whole other thing to play live gigs together. The fact we'd spent a fair amount of time on the road really made a difference going into the studio. We had it worked out what everyone's role was. The idea in general was to make sure to give everyone a certain amount of space to shine." The Golden State-Lone Star Blues Revue's self-titled album, released in April on Electro-Fi Records, has been one of the year's most acclaimed blues records, with a Blues Music Magazine review proclaiming it "carries the torch for Traditional Electric Blues with Style and Class. Top Notch." "The main thing I'd say that's a real advantage to where we're all at is the fact that there are so few older guys still out there playing the type of blues we play," Hummel says. "When we do play it does stand out next to a lot of the other blues bands. It's the real stuff compared to what you hear, a lot more rock blues now." The Golden State-Lone Star Blues Revue features a mix of originals from several band members and carefully chosen covers, "songs that haven't been recorded to death," Hummel says. "I try to find a balance of different styles, different beats, different kinds of riffs," Hummel says. "There are a lot of different things coming out of that album, in terms of influences and where songs came from." The result is a democratic record, Hummel says, that achieves the band's goal of giving space to each of the players, so the five distinct personalities shine through. "Everybody has had so much time under their belts in terms of playing gigs, everyone really does have a ton of personality," Hummel adds. "It's guys who are tried and true with the genre. There are no weak spots in the band at all." The band will perform at KXCI's 5th Annual House Rockin' Blues Review, part of a two-month tour that features some other festival type shows, after an earlier summer run of mostly club shows. "It's a real joy to be able to pay for an audience that already enjoys what you're doing," Hummel says. "A lot of the time, we play to people who don't really know blues all that well." But the band also relishes the opportunity to wow crowds who are unfamiliar with the blues. "A lot of times young people will come up and say 'You guys are great, how come I've never heard of you?' Blues has never been the moneymaker other genres have been. Blues and jazz are at the bottom of the barrel for commercial potential, compared to rock or country," Hummel says. "It's gotta be a labor of love if you're a blues player. I always find it amazing when people are shocked to find that out. Most of us have known it our whole careers. All of us have made a living from playing blues our whole lives, so it's not that you can't do it, but you're not going to buy a mansion in Beverly Hills." Having so many years under their belts, the band members are thrilled to have a new project that can get them excited night after night like it's a first gig again. Feeding off each other, they each bring something new to the table each show, keeping themselves as well as the audience entertained with the best effort they can put forth. "We keep our youthful spirits up, but that's the great thing about playing the blues," Hummel says. "It isn't something you have to pretend you're 16 to do. It's not like being an old rock 'n' roller. I feel bad for them when they have to pretend to be something else, being 60 years old. With blues, you're just hitting your stride at that point."